En route to Xishuangbanna, I had a long layover in Kunming, so I ventured into the city to nab a bowl of the regionally famous 过桥米线, or Bridge Crossing (Crossing the Bridge?) Rice Noodles. 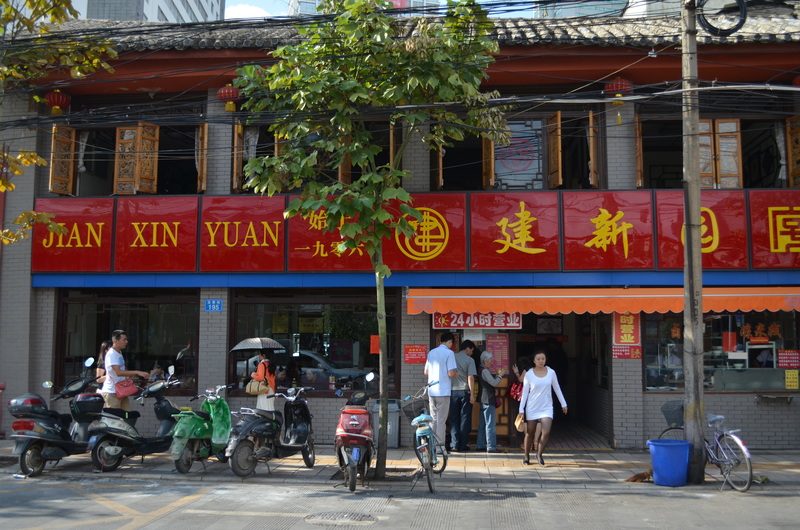 One of Kunming’s most famous outlets (there are a handful, of which two are considered the best and have correspondingly become city-wide chains). I went to 建新园, which loosely means Delicious Bowl of Soup Noodles. Just kidding. But that’s essentially what followed. I ordered and took my ticket upstairs, where a gracious but stern lady with strong arms sat me in the corner and told me to wait. This is what I was waiting for. Part of the charm of Bridge Crossing Noodles is definitely the showmanship of these little plates, so colorful, sometimes mysterious. It’s definitely visually indulgent, and whether or not I’m actually getting a lot of food, it feels that way. (Also, yes, I got a lot of food.) The bowl in the upper corner is a heavy ceramic one filled with steaming hot chicken soup, albeit tinged with a bit of what I think was goat, something gamey for sure. 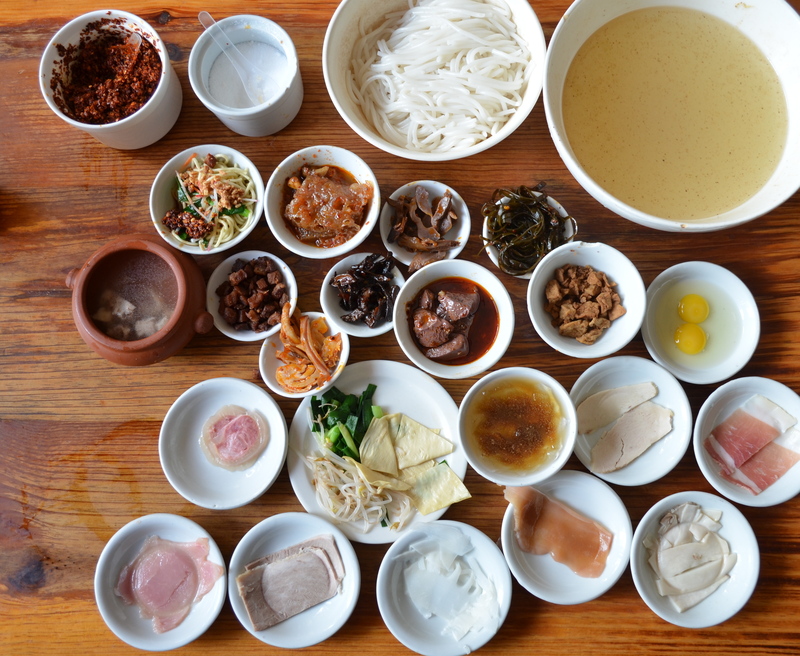 Each of the little plates then went into the hot soup to cook, in order of rawness (eggs first, then seafood, then meats, then veggies, then noodles). The strong-armed lady yelled at me for taking photos and thus letting the soup cool a bit, which in fairness was probably something to avoid, for both of our interests. I didn’t need to worsen my chances of a funny stomach in a place like Yunnan, but luckily these handful of photo-happy minutes did not do me in. And then, after a few minutes, you dig in. 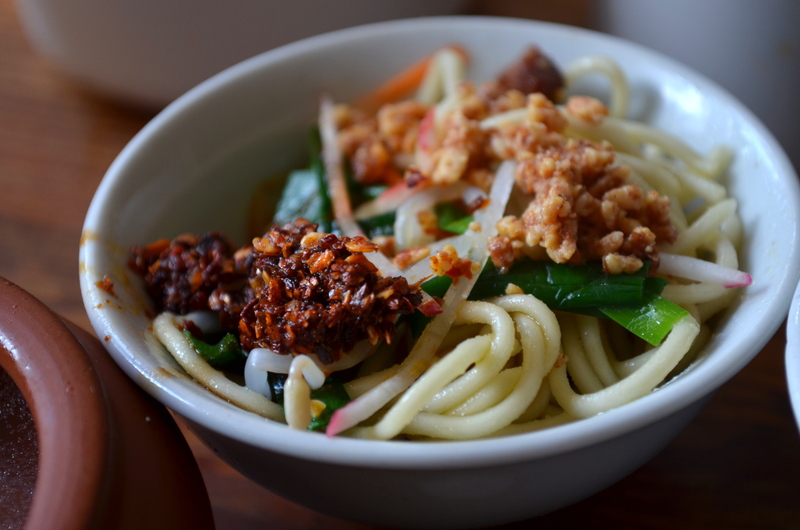 The noodles were, beyond the initial captivatingly DIY experience, quite satisfying. 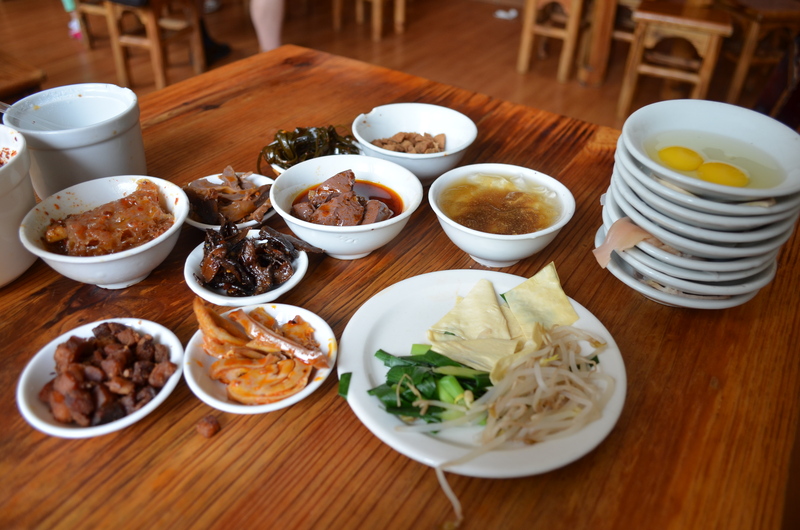 The hearty stock and heat really seep into your bones (this was August, so I didn’t really need heavy reinforcement, per se, but Yunnan was actually a tad chilly for some reason). 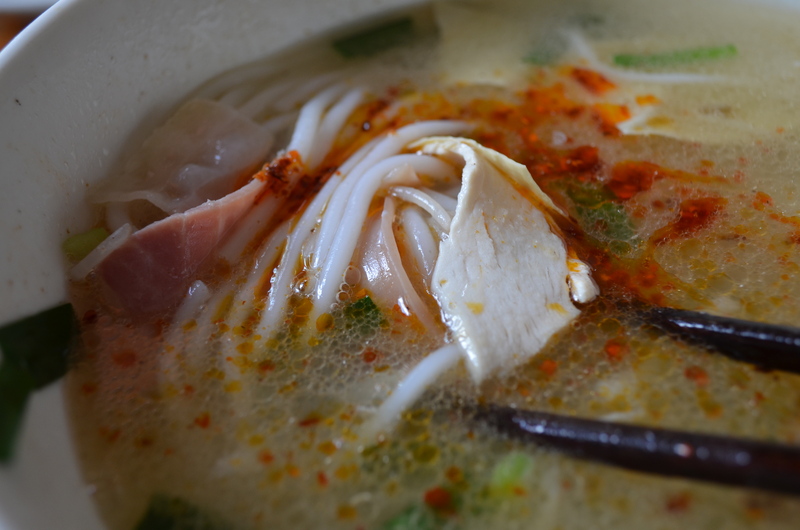 The rice noodles themselves were fresh and springy, and the slivers of wonderfully softened Yunnan ham (not entirely dissimilar to prosciutto) were briny treasures when fished out of the broth. Which goes to the notion that one’s Bridge Crossing Noodle experience is greatly defined by the choice of goodies tossed into the soup. Be willing to shell out a little extra, both for the flavor and for the fun. 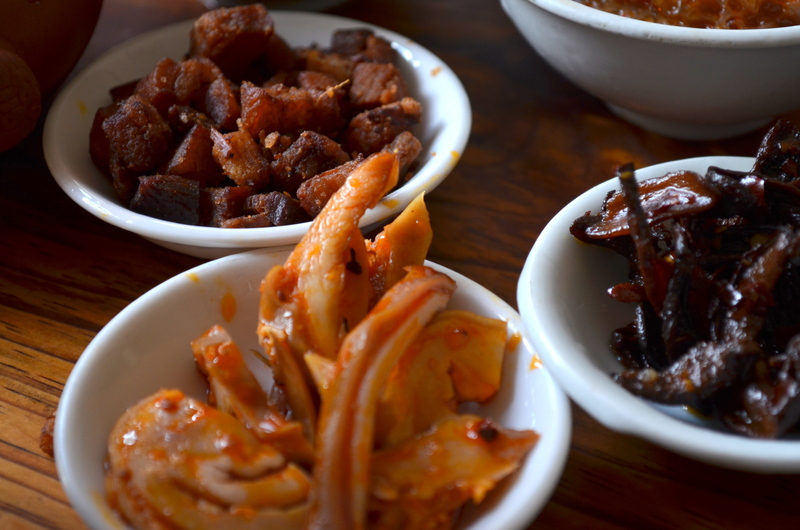 My meal also came with a scattering of small eats, of which my absolute favorite was the fried pork fat & crackling. Are you even remotely surprised? You can buy this by the bag, to go. I seriously thought about it on the way out.